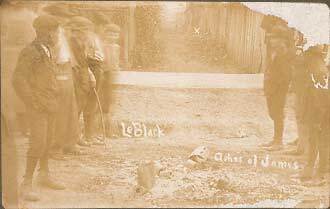 Group of young boys, black and white, standing around ashes of Will James. November 11, 1909, Cairo, Illinois. Etched into negative: "X," "leBlock," and "Ashes of James." ink inscription on reverse: "Where the cross is where Miss Pelley was found this alley is between 25 and 26th running East + West and between Syc + Elm running N. and S. the ashes of James is on Syc between 25 and 26th st." Addressed to "Mrs. Jake Petter, 2057 Broad St, Paducah Ky."